Even though I agree it’s good to support the grass roots industry of synth module makers. But again, only if you can afford it. Also Modular synth jams are usually all guys, trying to make the loudest (and most expensive), acid squiggle sound. Unfortunately for me, I feel, it’s all becoming a bit of a cliche, resource hungry (how sustainable are all these elegant components? ), rich persons hobby and nothing much to do with making music, which brings me back to why I have always wanted to own a modular synth… To make my own electronic experimental synthsiser music with it, live and on recordings. About 10 years ago, after visiting a eurorack modular synthesiser shop and being told that the kind of synth I was after would set me back £2,350 (without a case). I thought f**k dat I’ll build my own. I’m not rich enough to afford those prices for a modular synth. In the end it took a long time. But I learnt loads of interesting stuff as I went along and now have a deeper understanding of electronics / synthesis, which informs my creative music making, because I built a basic modular synth myself from the beginning. It also got me thinking… lots of people worldwide, would be interested in a very very cheap modular synth too. 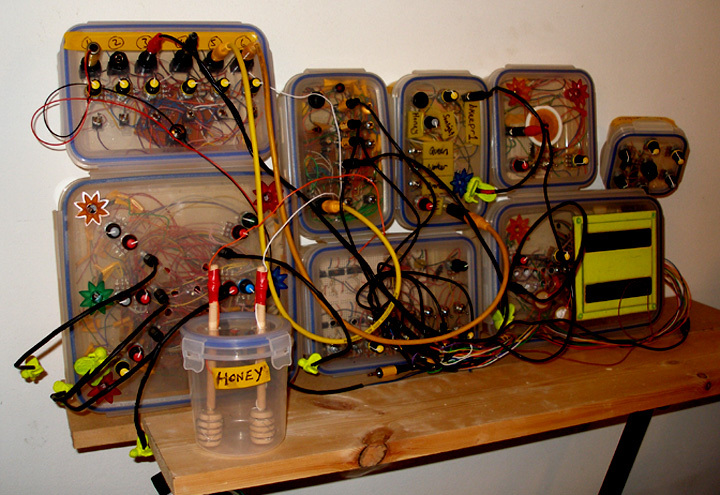 A modular synth made from mainly re-cycled and shared or disused parts. An basic affordable modular synth for the poor people of this world so they would not have to work for 20 years to own. So I began to build my own modular synth, slowly. What follows here is a basic guide or short course in how to build your own modular synth very cheaply. This is not how much these parts cost if you go to high street shops like Maplins or even Amazon, but how much you should be able to get parts from if you do plenty of research and shop around etc. For simple synth cases. Start out by going to car boot sales, second hand markets/shops, ebay, charity shops ect and look for a good deals on plastic tupperware type food cases in various sizes, try to buy at least 3 or 4 for about £2 or less. Next go to you local Hackspace, electrical shops, electrical recycling centres, freecycle networks etc and ask for old elecrical components that are being thrown out, old parts, wires etc. Rip pots off circuits from old broken Hi-Fis etc, audio connectors, jack/phono plugs, LEDs, strip-board off-cuts, etc. I once got a fully working echo/reverb unit from a old karaoke playback cd unit, where the cd player was bust but the mic inputs and echo/reverb unit worked fine. Share buying parts with others who are also building synths. Look for great deals on ebay, like 100 pots for £11 with free postage and share the pots between say three people. Works out a lot cheaper. Tools needed: soldering iron, solder, wire strippers, pliers. Make use of them at Hackspace’s / share equipment/tools with others. Follow online guides, of what chips (ICs) to use, 4049, 74 chips, 555 etc. Download the free version of Handmade Electronic Music, get Make magazine books from library, attend synth making workshops, ask other makers to show you the basics, learn and keep learning for hours, without paying huge education fees. Circuit diagrams take time to understand, so learn quicker by starting to play with synth circuits on breadboards and 9 volt batteries to play safe. Once its up and running move the synth circuit over to a basic strip-board design. Carefully cut holes with a pointed knife in the plastic Tupperware boxes for pots, switches and audio connectors. No drill needed. Start with one small synth, in it’s own plastic box, connect to the next one you build using LED and LDR synchronisation or put at sync input into the chip from a separate 555 timer. Eventally build a 4049 sequencer to run all your growing collection of mini synths. Build a small mixer so all the oscillators can be mixed live. The original idea for my Hive Synthsiser was that I’d heard queen honey bee ‘Piping’ in my beehive in spring, around swarming time and wanted three oscillators (eg. Queen, Worker, Drone) to somehow chant and reply to each other. Through recording, using stereo mics, inside my beehive for houndred of hours. I’d worked out using software analysis some basic bee frequency ranges. More about my Bee Frequencies research here. This baby Bee Synth is one of the first designs for a self contained mini synth that I made. I wanted to introduce a LFO but was’nt sure at the time how to do this until i tried this combination. The oscillators do seem to chant and reply in a emotional feedback kind of way (a few hours practice helps). A happy accident, which I kept and still enjoy playing. Here is a video of me performing at STWST48 in Linz, Austria, during ARS Electronica 2015. The video starts where I perform a solo with my ‘Baby Bee Synth’. I needed some sort of ‘organic resistors’ in my ‘Hive Synthsiser’. And was trying propolis (a red or brown resinous substance collected by honeybees from tree buds, used by them to fill crevices and to fix and varnish honeycombs) in a water solution. This failed at first because the water is a super conductor and makes the current pass from one honey tasting stick to another instantly. But when I mixed the propolis with a jar of my runniest honey it worked. This honey I tested at about 17.5 % percent water, making a perfect resistor for integration anywhere in the signal chain of my Hive Synthsiser. It can speed up and down sequencers, change oscillators pitch, even dim or brighten LEDs. The above video clip has me playing it before the baby Bee Synth. rewind. …..Ongoing guide more added soon….